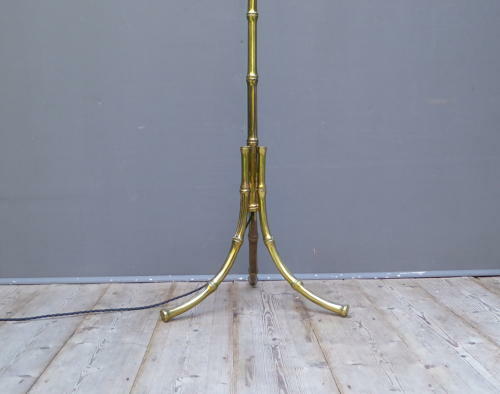 A beautiful large vintage floor lamp in the manner of Maison Bagues. A stunning piece of vintage lighting, cast in gilt brass with the three gently curved legs supporting a central upright, all in the faux bamboo style. A handsome, elegant & extremely high quality lamp. Wear commensurate with age, good condition with some light wear to the gilt finish in places. UK courier service available at £45 tracked & signed for 48 hour delivery (Due to its height the lamp will be sent via a 'Large' service, hence postage cost). All electrical items should be be checked and / or installed by a qualified electrician prior to use.